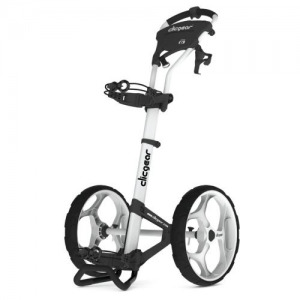 The Clicgear Model 6 is a unique cart option for those golfers who store their equipment at the course or live near the course. Oversized 17" wheels make maneuvering through all terrain a breeze. As with all Clicgear carts, the Model 6 is constructed using aircraft grade aluminum tubing. Weighted lower bag support creates proper balance and keeps cart from tipping backwards like many 2-wheel carts. Adjustable handle height and upper bag saddle allows for all bag sizes, including youth bags. Adjustable bag straps and a scorecard tray round out the features. Cup holder and umbrella holder included. If you have any questions regarding the Clicgear Model 6 Golf Push Cart, please give us a call, we would be happy to help you with any questions you may have. Write an online review on the Clicgear Model 6 Golf Push Cart, and share your thoughts with others.